At Cenveo Publisher Services, we created The Publisher's Office based on 130+ years' experience with society and association publishers. The Publisher's Office provides full-service editorial and production management for journal publishers. By providing product, technology, and service combined with editorial and author/editor support, our mission is to promote organizations as recognized leaders in their publishing field. Record-setting turnaround times are changing the expectations of society publishing programs, making it possible to go from Word manuscript to author proof in just 24 hours. The Publisher's Office is also the central location of an R&D team of Publishing Workflow Analysts focused on creating innovative tools that allow publishers to be on the cutting edge of preparing and delivering dynamic content. 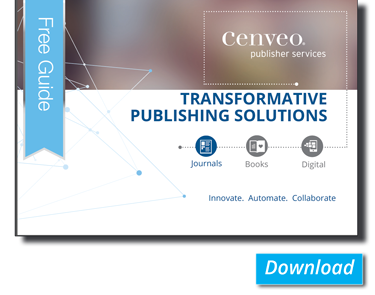 Download our guide, "Transformative Publishing Solutions," and learn more about the services we offer.